We developed advanced content management system, which is yet intuitively effortless to use. You may add pages with 2 clicks. Main navigation menu is among of the first things what visitors see, when they arrive to your website. It is important, that links in menu reflect true structure of your venture. Only in this way wisitors are able to grasp, what your website is about and navigate between sub pages with easiness. At first find in website structure, where you would like new page to create. You may go to the top page, under which you would like new page to appear, or to any pages on the same level you would like new page listed. When in right spot, just click "Add new page" to open new page creation dialog. You may write link text and choose what kind of page you would like to create. With clicking "Save" button, new page will be created and you may proceed with editing it's content. 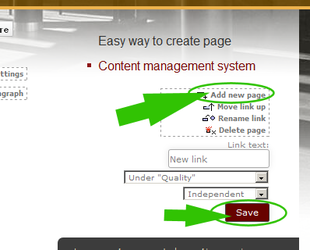 Content management system offers you straight way to create new page, without overwhelming you with unnecessary details. You may save new link even without writing anything to "Link text" field, in this case it will be filled with default text, for example, "link750" which you may edit also later. Main navigation menu is among of the first things what visitors see, when they arrive to your website It is important, that links in menu reflect true structure of your venture We developed advanced content management system, which is yet intuitively effortless to use. You may add pages with 2 clicks.